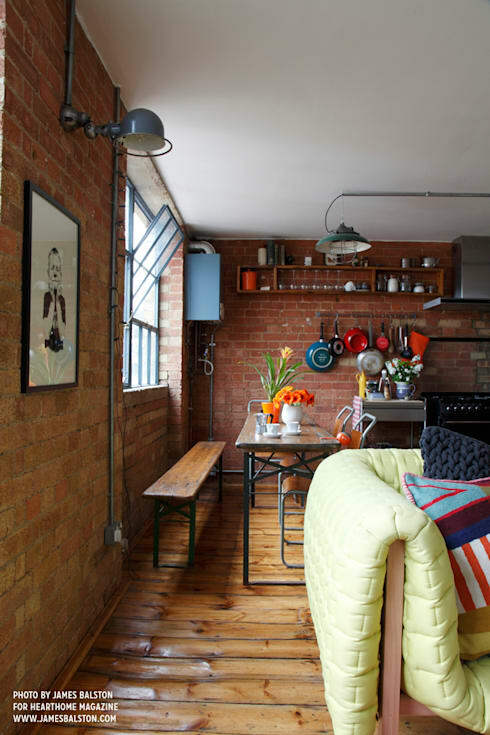 In an old warehouse building in the East End of London, interior designer Cassidy Hughes has created a beautiful, bright and cosy two bedroom apartment. When the designer came to the project, the warehouse had already been converted to residential, but was in need of some TLC. The space already boasted lots of charm and industrial chic in its basic architecture, which the designer put to work for her. 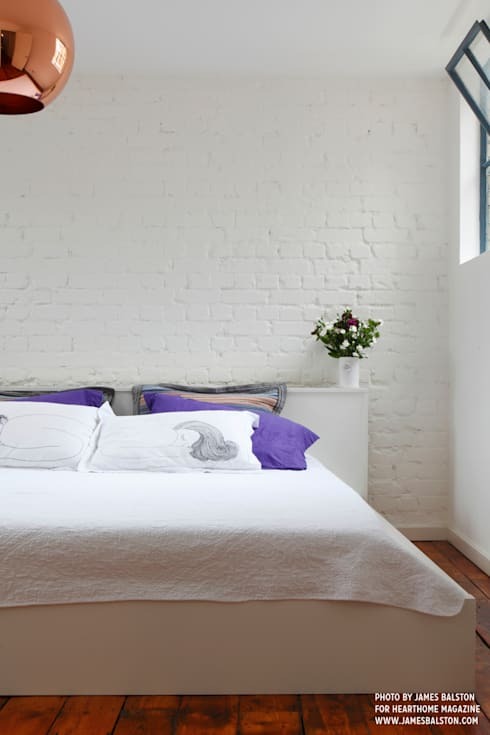 Walls were removed to create more of an airy, loft feel, and the finish in the master bedroom was stripped back to its original brick. The end result is a space that's totally sympathetic to the building's heritage, but chicly contemporary and cosy at the same time. In the kitchen, a partition wall was removed to create an open plan kitchen-dining-living room. The lamps speak to the industrial heritage of the apartment, while black kitchen cabinets look appropriately slick and urban. Vintage furniture softens the overall effect, while the blackboards are a nice touch to give the whole thing a personal and individual look. The idea of the design was to maintain all of the existing architectural features- like the wooden floor, the warehouse windows and exposed brick walls—but to clean and modernise them to create a warm and welcoming space. 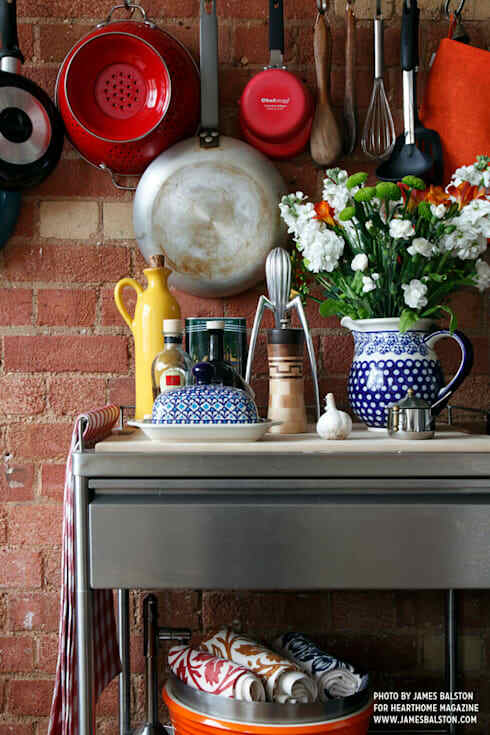 Vintage crockery and splashes of colour ensure that the overall effect isn't too intimidatingly industrial. It's the marriage of these soft touches—whether accessories, colourful furniture or flowers—with this stark industrial space that make this apartment redesign really special. The original hardwood flooring, before remodelling, wasn't in great shape. A specialist was brought in to refinish them, but was instructed to leave all of the original warping and indentations as they were. The idea was to highlight the existing architectural details, drawing warmth from the flooring and exposed brick. The result is that, despite the large windows, the room has an incredible aspect of warmth and cosiness. The furniture is a mix of IKEA, cool flea market finds—including a former beer table set from Germany—and a bright green sofa that centres the space and catches the eye. The furniture was chosen to maintain the open feeling of the space, and nothing is anchored to the floor. The bathroom was a completely remodelled, with the existing walls, tiles floors and fittings all removed and replaced. 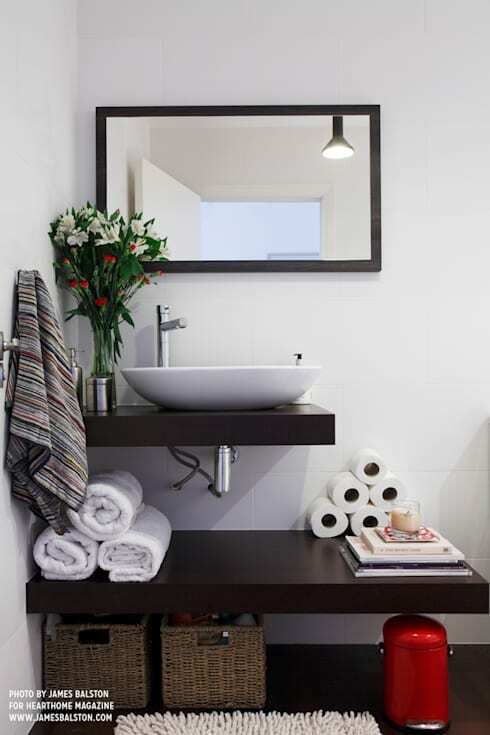 Before renovation, the apartment had both a master ensuite bathroom and a main bathroom. Half of the master ensuite was requisitioned to enlarge the new main bathroom; the other half became a walk-in wardrobe. Looking from the living space into the kitchen, we see the benefits of the open plan, as light floods the space, creating a warm glow as it hits the wooden floors. The warm wood of the vintage industrial dining table and bench adds to the cosy effect, as do the flowers and plants scattered throughout the room. In the bedroom, the client wanted a fresh, minimalist style with few frills. 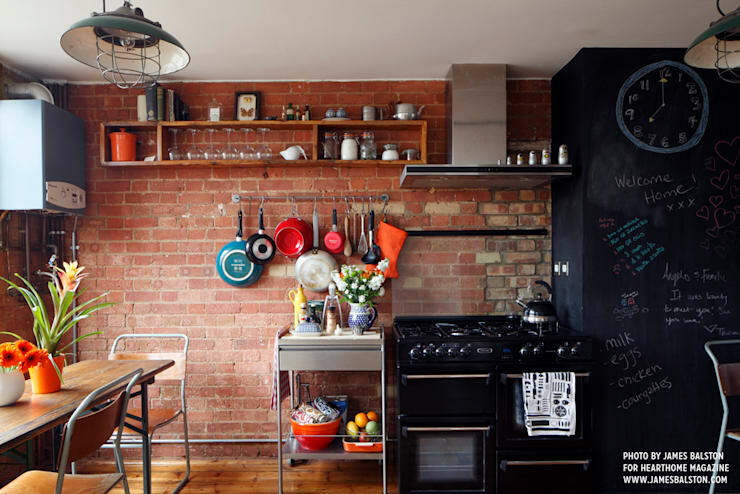 To do the cool industrial look of the apartment justice, the plastering was stripped from the brick wall to expose the original brick, and then whitewashed, giving a cool, clean and relaxing feel to the space. It's the details that make an apartment into something very special. To fully unleash the potential of the former warehouse with its amazing windows, floors and walls, lovely little accessories were added. 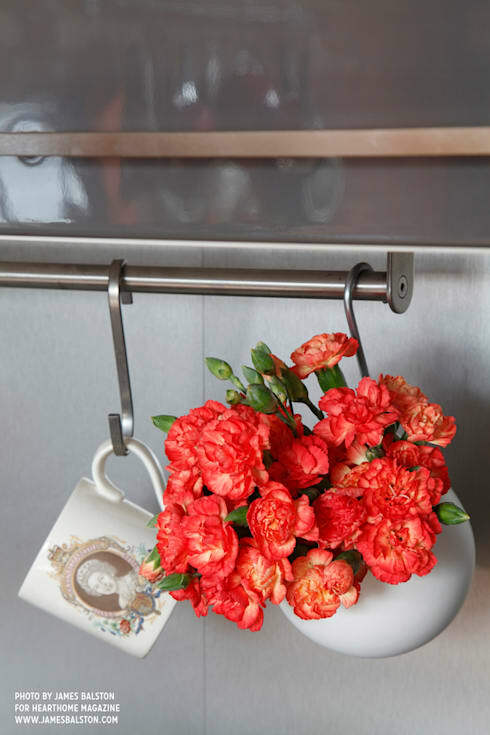 As befits a true London flat, the Queen was given her space on the wall, and cheerful flowers are not just displayed in a simple a vase on the table, but hang in the kitchen. 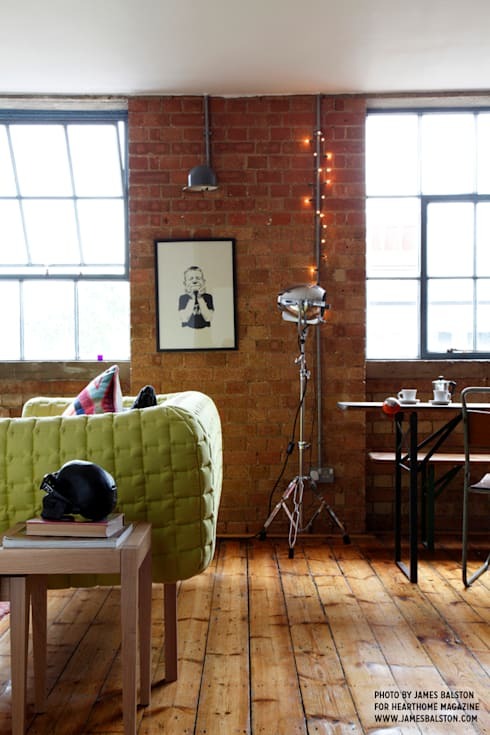 Do you like this cool old warehouse apartment? Let us know in the comments!